These tacos are the perfect easy weekday meal — fresh, delicious and totally satisfying! Gluten-free corn tortillas stuffed with lemony kale + tomato salsa + corn + lentil walnut taco filling and topped with smashed avocado and sour cream. The lentil walnut filling is essentially two ingredients + some spices mixed up in the food processor. The walnuts mixed with the lentils give it a “meaty” feel. Nutrient dense, super quick and easy and so yummy! The filling makes enough for 4-6 servings but since it was just me and my husband enjoying them, we had extra which kept well in the refrigerator. Recipe and inspiration from my friend Corey at The Vegan Six. I’m super excited that Corey let me share her lentil taco filling recipe with you. If you’re looking for more whole foods, plant-based recipes (mostly glutenfree or easily adapted), definitely check out Corey! NOTE to Celiac Friends: Gluten-Free Watchdog has recently done more testing on lentils and cross contamination continues to be a potential issue. So WASH LENTILS BEFORE COOKING and pick through them or errant wheat and barley. For more, click here for the Gluten-Free Watchdog post. 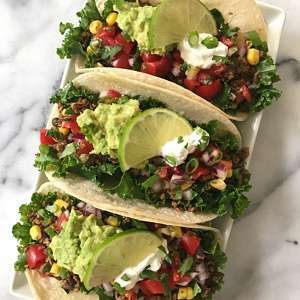 Hearty and delicious, plant based tacos that make for a super quick and easy dinner. Taco filling recipe and inspiration from my friend Corey, The Vegan Six. 1½ cups cooked French lentils (French lentils will give a heartier texture. Regular lentils will create a texture more like a lentil spread) NOTE: celiac friends, make sure lentils are labeled gluten-free, rinsed and picked through. See comments about lentils and cross contamination above. Heat tortillas in a microwave (under a damp paper towel works best to make them soft and pliant). Top each tortilla with kale, lentil walnut taco meat, salsa, corn, smashed avocado and sour cream. Garnish with fresh cilantro and or scallions to taste. Do you cook the lentils first or pulse them raw?